A large tree just came down at approximately 9:50pm this evening on Remsen Street. It was growing right alongside the building at 33 Remsen and fell across the road on top of at least three cars, with one parked in front of 34 Remsen taking the brunt. A firefighter is already on the scene with a chainsaw at 10:05pm. 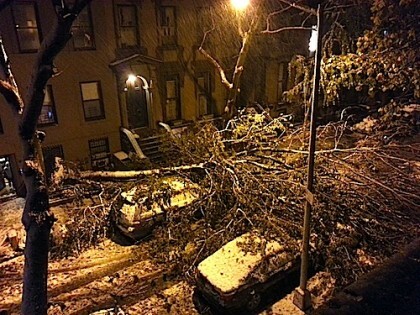 The tree still had most of it’s leaves and, weighed down by the wet snow, it came down in a gust of wind. The root ball doesn’t appear to have damaged 33 Remsen, which is amazing given how close to the building it was growing.